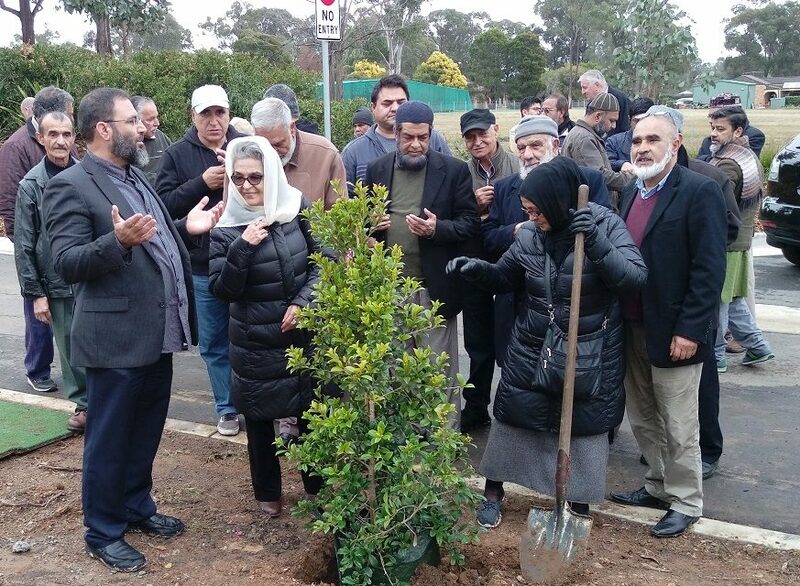 An Open Day was held on Saturday 8 September at Muslim Lawn, Kemp’s Creek Cemetery attended by a large number of Muslims, both men and women representing Sydney’s multicultural community. Two busloads of middle and mature aged men and women from the Afghan community were were joined by members of the Indonesian Islamic Association, the Islamic Association of Western Sydney (Rooty Hill Mosque), the Hills Awqaf Trust, Quakers Hill Mosque, the Malaya association from Arncliffe (Masjid Darul IMAAN) and Dee Why Mosque arrived to take part in the inauguration of the Muslim Lawn. 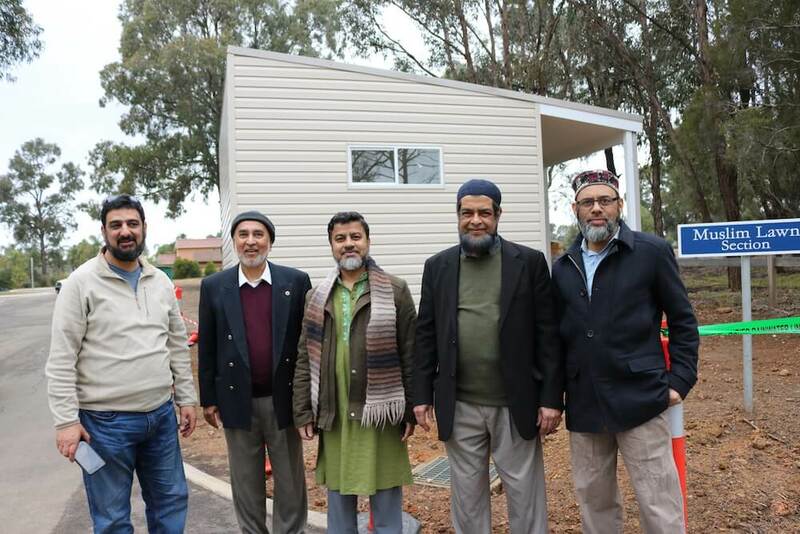 In front of the prayer and ablution facility at Muslim Lawn, Kemp’s Creek Cemetery: From left, Mr Anjum Rafiqi, Mr Kazi Ali, Dr Rafiqul Islam, Dr Muhammad Khan and Mr Shah Mustaque Parvez. 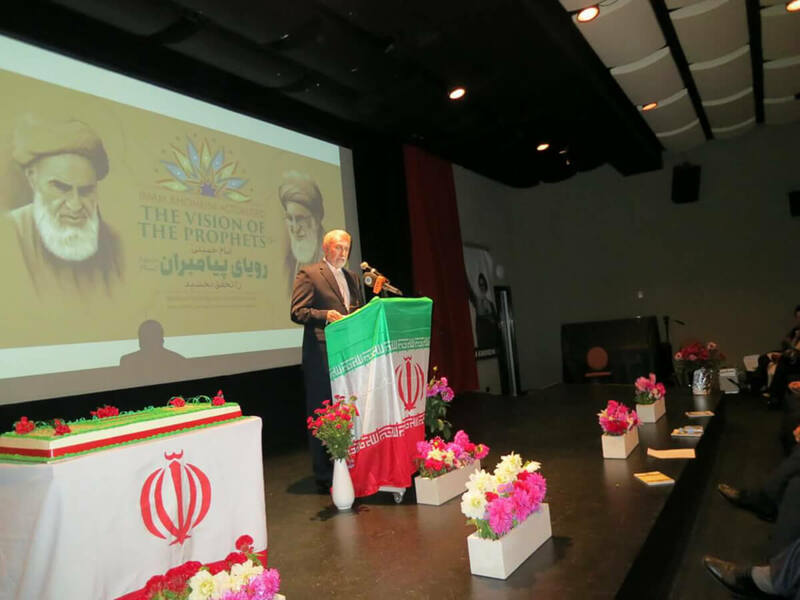 (Photo by Zia Ahmad). The community leaders and their families were greeted with a warm welcome by Mr Peter O’Meara, the CEO of the Catholic Cemeteries Trust. 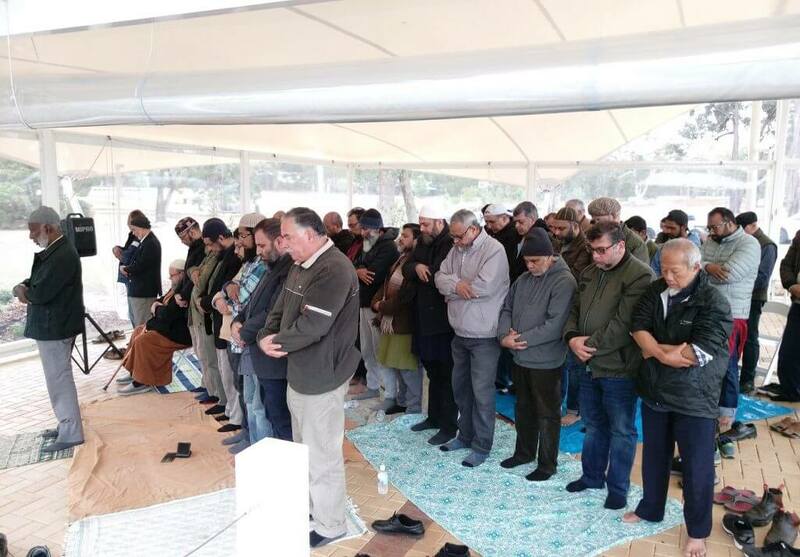 Upon arrival, the visitors made dua (supplication) at the site of the recent first burial, from the Afghan community, that had taken place during the last week. Mr Nader Azmi showed the visitors around the Muslim Lawn and explained the process of allocations and burial at the cemetery. The cemetery has just begun taking Muslim interments, facilitating both single and double depth interments. 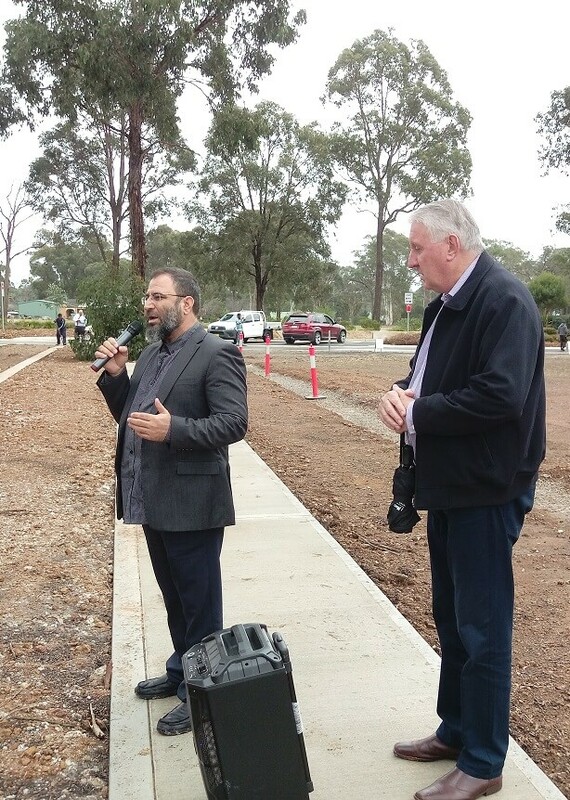 Mr Azmi, joined by Mr Tamim Anwaryar, praised the recent signing of the Memorandum of Understanding (MOU) between the Riverstone Muslim Cemetery Board and the Catholic Cemeteries Trust that has allowed for Muslim burials at Kemp’s Creek to become a reality. 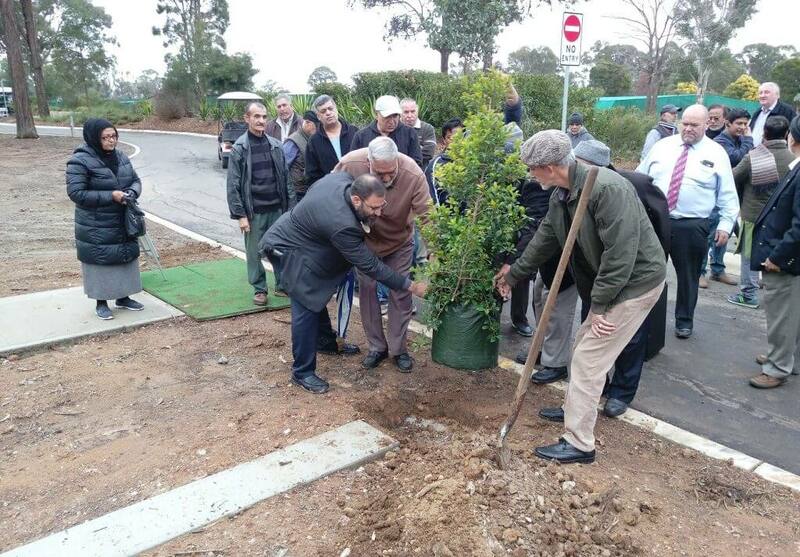 The Afghan community leaders, both males as well as females together planted a native tree in their allocated section to mark the occasion. The visitors were also shown around the recently built prayer and ablution facility that is available for community members to use, when visiting their loved ones during the opening hours of the cemetery. 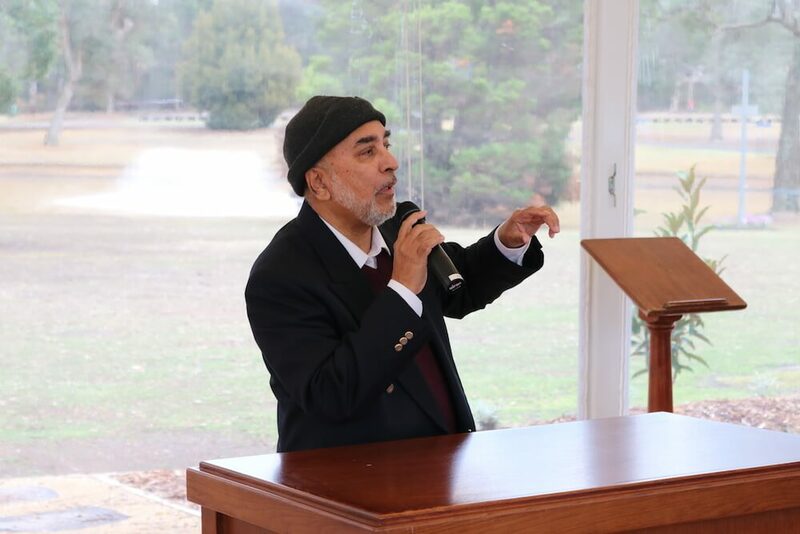 Mid-day Zuhr prayers were performed in congregation led by Mr Usamah Alamudi in the main pavilion, followed by some tasty refreshments contributed by the hosts as well as the guests. Zuhr prayers in congregation led by Mr Usamah Alamudi in the main pavilion. 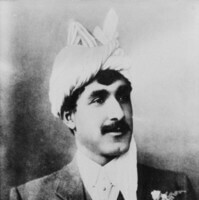 (Photo by Anjum Rafiqi). 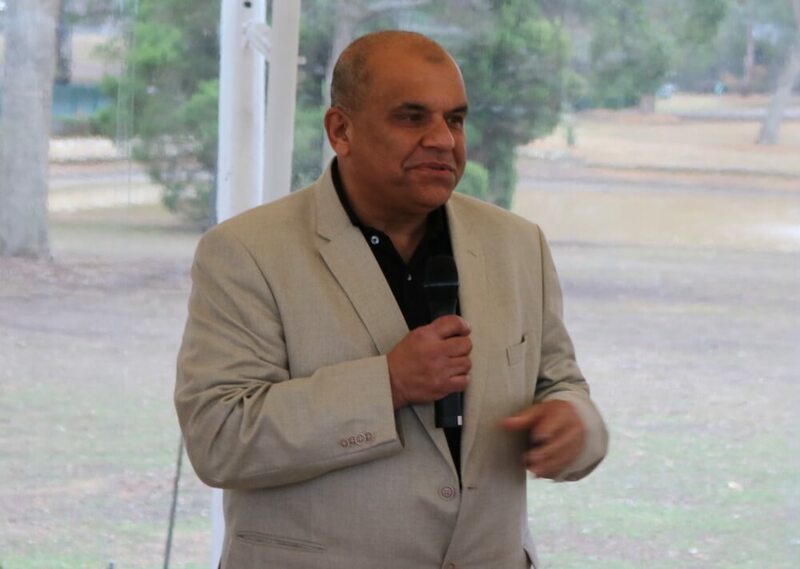 Mr Kazi Ali and Mr Peter O’Meara thanked the community members and pledged to continue to work together as they sought to extend their inter-faith engagement into the future. 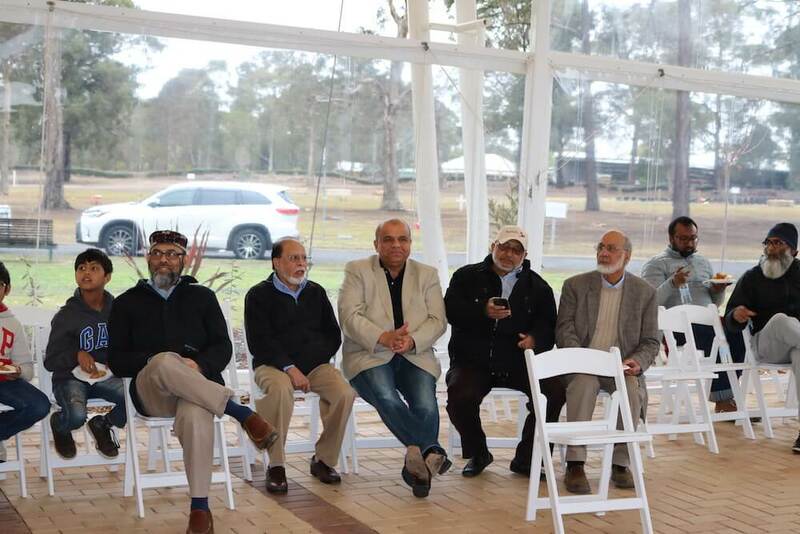 Community representatives, Mr Abdur Rahman Crossingham, Mr Sohail Shamsi, Dr Muhammad Khan also thanked the Kemp’s Creek Management for their cooperation and pledged their support to the Catholic Cemetery Trust projects, seeking to make more burial sites available to the wider community. 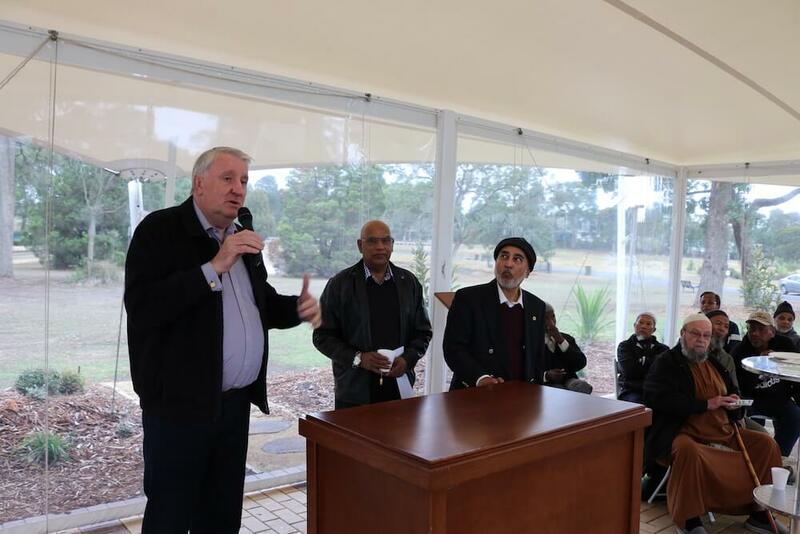 Caption: Mr Peter O’Meara, the CEO of the Catholic Cemeteries Trust addressing Muslim leaders on Open Day watched by Mr Azam Ali and Mr Kazi Ali with Mr Abdur Rahman Crossingham seated in front. (Photo by Zia Ahmad). At Kemp’s Creek Cemetery, community organisations are able to reserve or pre-allocate burial places in the Lawn dedicated to their community. This empowers organisations to extend immediate assistance to their communities, particularly during the difficult time when loved ones have pased away. 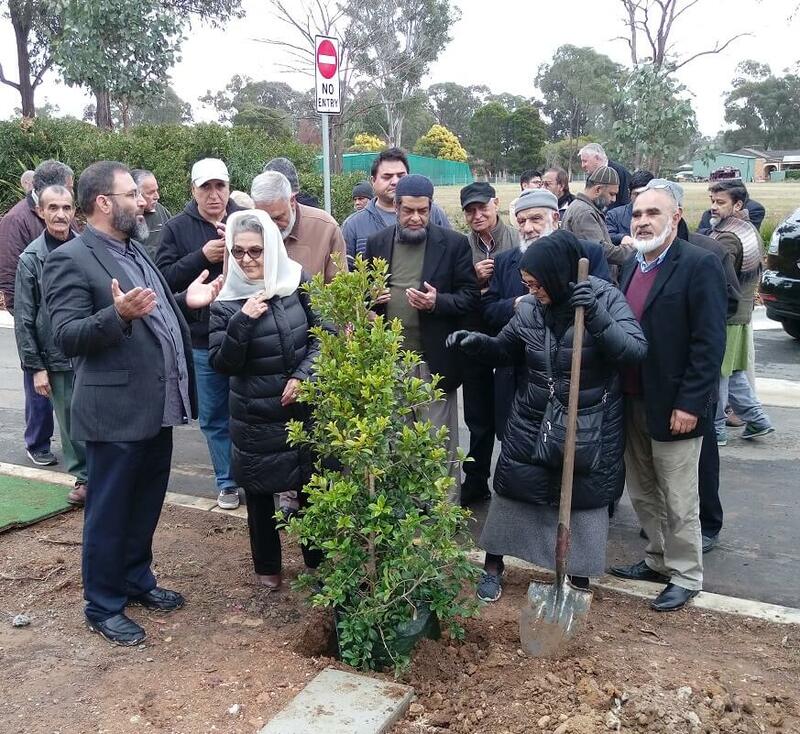 The Riverstone Muslim Cemetery Board (RMCB), a not for profit organisation run by volunteers, has been at the forefront of facilitating burials in Sydney’s West since 2000. 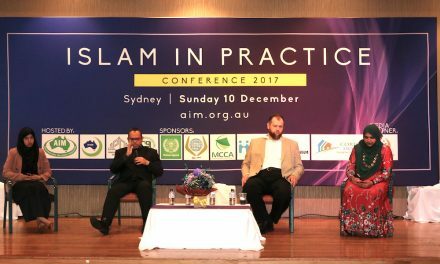 The RMCB, alongside Islamic Co-operative Finance Australia, is also finalising the first Member Burial Expense Funds in association with interested community organisations. Queries regarding burials and/or pre-allocations at Kemp’s Creek Muslim Lawn Section may be direct to the RMCB by contacting Kazi Ali on 0406 626 744 or Azam Ali on 0432 169 026.